Tell your members of Congress to oppose President Trump’s plan to expand dangerous offshore drilling for the health of the ocean, communities, and the local economy. Sign the petition here. The Pacific coast is home to a diversity of marine life. Cold, nutrient-rich waters attract and support everything from tiny krill to huge whales, as well as some of the most lucrative fisheries in the nation. However, offshore drilling related spills and chronic oil leaks put wildlife, the ocean economy, and the health of communities at risk. In April 2017, a Presidential Executive Order threatened to re-open the Pacific coast to expanded offshore oil and gas drilling, placing invaluable ocean resources and coastal economies at risk. 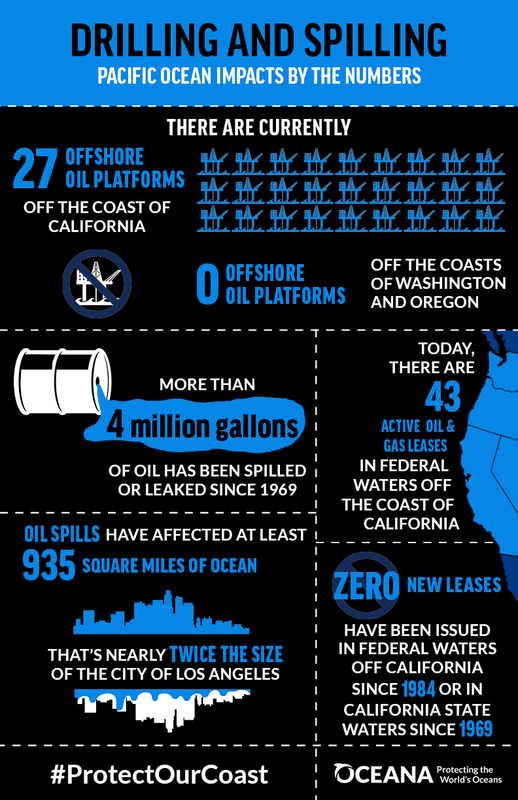 Now is the time to protect the coast from expanded offshore drilling. Fortunately, nationwide opposition to offshore oil and gas drilling has been mounting for years. 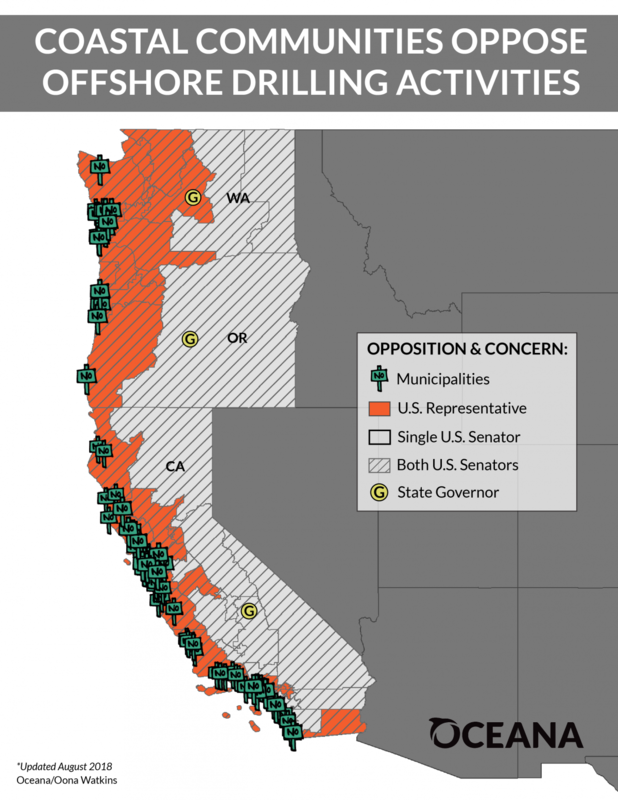 Currently, more than 340 municipalities across the country have formally opposed the expansion of offshore oil and gas drilling activities, including over 90 along the Pacific coast. These dirty and dangerous drilling proposals put at risk nearly 746,000 West Coast jobs and $53 billion in gross domestic product (GDP) that rely on healthy ocean ecosystems and a clean marine environment. 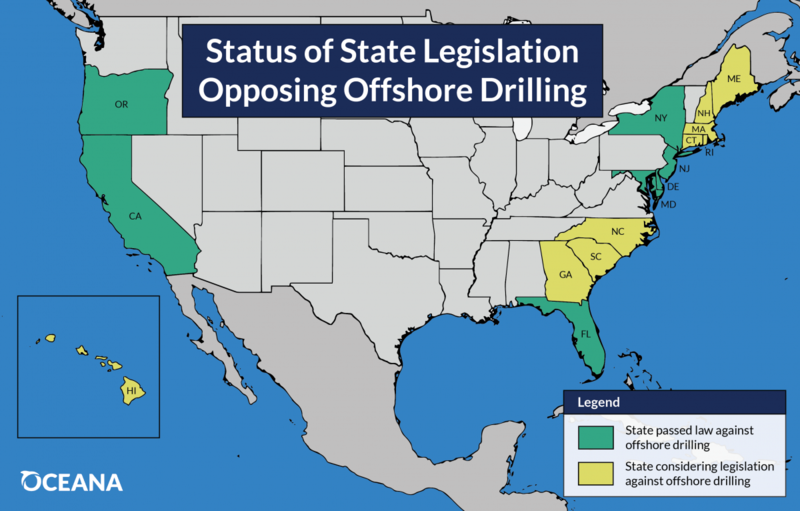 Many West Coast leaders vocally oppose expanded offshore oil drilling including California Governor Jerry Brown, Washington Governor Jay Inslee, Oregon Governor Kate Brown, California Lt. Governor Gavin Newsom, Attorney General Xavier Becerra, the California Fish and Game Commission, the California State Lands Commission, and the California Coastal Commission. Local communities are making their voices heard by passing resolutions opposing expanded offshore drilling along the Pacific coast. Map of municipalities that have adopted resolutions (pink stars) opposing offshore drilling. Click on each city/county to view additional information and link to resolution text. 17 Senators: Led by Senator Menendez (D-NJ), a letter was sent to Acting Secretary of Interior David Bernhardt asking him to clarify his position on offshore drilling before his confirmation 3/20/2019. 23 Senators: Led by Senator Markey (D-MA), a letter was sent to Secretaries Ross and Zinke to express opposition to the issuance of five incidental harassment authorization (IHA) permits that would allow companies to conduct seismic airgun blasting surveys along the Atlantic coast. 93 U.S. Representatives: Led by Congressman Rutherford (R-FL), a bipartisan letter was sent to Interior Secretary Ryan Zinke and Commerce Secretary Wilbur Ross expressing strong opposition to the issuance of 5 Incidental Harassment Authorization (IHA) permits to companies planning to conduct seismic airgun blasting surveys along the Atlantic coast 12/6/2018. Oregon Governor Kate Brown: Issues Executive Order opposing exploration and production of oil or gas off the Oregon Coast and to prevent the development of any infrastructure associated with offshore oil and gas drilling (10/24/18). Los Osos, CA Community Elected Officials: Sent letter to BOEM opposing the 2019- 2024 Draft Proposed National Oil and Gas leasing Program and any expansion of offshore drilling of the coast of California. Mayor, City of San Leandro, CA: Sent letter to Secretary Zinke opposing new offshore oil and gas drilling (3/9/2018).